This year’s Winter season brought very cold temperatures to the Washington DC area but very little snow. The DC area hasn’t had a winter this cold with so little snow in 30 years. We live a region of the country where 1 degree will determine if we get snow…we like to hover around the 32 degree mark. When it gets colder than 32 degrees, our chances for snow increase. Typically when our December and January months are very cold, we will get a decent amount of snow…averaging about 8 inches….but not this year. This year’s snow accumulation for December and January was a pathetic 3.1 inches. The last time DC had such cold temperatures and so little snow in December and January, was in 1985-1986. Even that year rounded out the season with a February storm bringing 13 inches. The DC area is also known to have snow storms well into the month of March. This year brought us a snow storm during the early part of the Spring season. Living in the suburbs of Washington DC, our home tends to get more snow than those residing in the city of DC. Our most recent Spring storm brought 5 inches to our home as seen though our kitchen window. In fact, I believe we had more school closings in our county this season for cold weather and wind, than for actual snowfall. The Spring storm brought a heavy wet snow. The sunny temperatures warmed the area and melted the snow rather quickly. Some visitors to our yard enjoyed the snowy weather too. Our backyard looks so beautiful during the storm, all the trees covered with snow and the lantern lights shining brightly. My favorite pictures from the storm come at dusk, from our front door. The picture is magical, a true winter wonderland…the column lights in our neighborhood are brightly lit and twinkling in the background. A true wonder of nature to behold. How about you, how much if any snow did you get in our area of the world? We had a lovely winter. A couple of weeks of really cold weather, and only a few bad snow days. More wind this year than snow! And the rain would usually wash it away in a few days! Too true! I wish I had of got to go skiing, but busy busy! Maybe next year! Skiing is such blast, we love going too. Lovely pictures! Those column lights are certainly nicer than streetlights! We here in Canada have had a colder snowier winter than most years. We missed those last two noreasters, as they have stayed south of the border, but it remains cold here, (still a bit of snow on my north facing back deck and no sign of spring, although my tulips are up about two inches.) Would your famous Washington DC cherry trees usually be out by now? Thank you for visiting! Yes our cherry blossoms are delayed, they were supposed to peak March 20 but have been pushed back..and will be in peak bloom around April 10! Can’t wait! I’m in Southwest VA and although we’ve had a very cold winter as well, the snow hasn’t been our friend. The little snow that we have received usually came with rain and so the grass would see some snow coverage but the streets didn’t get any so it would kind of pointless to me! Maybe next year. I like at least one big snow a year! But I’m ready for Spring now! I’m ready for Spring too Toya! Sounds like you have had a warmer than normal Winter. Hopefully next year, we will get a couple nice storms…they are so beautiful! Thanks Ingrid! I really enjoyed what little snow we did get. I hear ya Lynn, makes for a big mess around the DC area when it snows…we don’t handle snow well. But it sure is pretty 🙂 I’m ready for warmer weather too! Hi, I recentlh started looking at your blog and love it! I am going to set aside some time next week to read all of your posts. It is the best. Thank you! I know it is very time consuming, but a labor of love. Thank you Sandra, so very nice of you…hope you enjoy my posts. 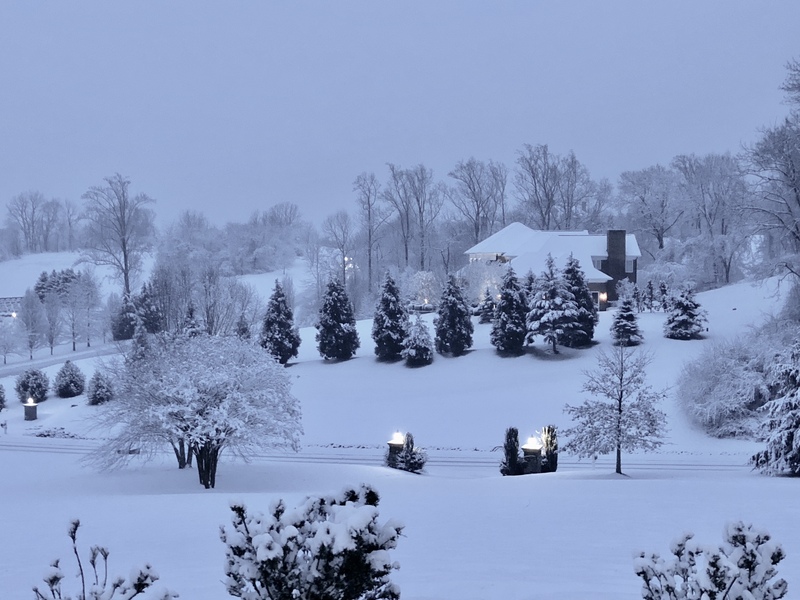 Your backyard looks like a beautiful winter wonderland! I especially loved your picture of the deer! I’m quite envious as we didn’t get much snow this winter up here in southern Ontario.